Double walled case for extra protection against impact and temperature extremes; case capacities are available for 5, 10, and 20 LTO tapes. 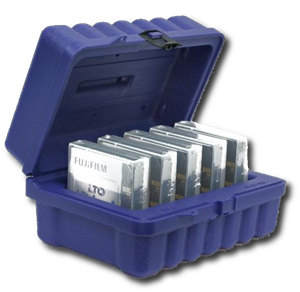 The LTO tapes remain in their plastic jewel boxes and are placed in molded individual slots keep LTO tapes upright and separate from one another; free of debris generating materials; stainless steel latches; fold down handle; padlockable for security. Lifetime warranty.